I will be posting later my take on The New York Rangers win in OT against our rival New Jersey Devils in OT (thanks Shanny)this afternoon. I was reflecting on fdarangers - who in the comments section included some clips of the flyers vs. rangers fights. I found the following clip and it is remarkable how much the new rules over the last five years have improved the game. This fight is brutal (pre-season as well) and would absolutely set the tone for a season of fights to come. 1) Dam right Scotty! Think anyone was sitting/leaving during that brawl? Think any fan would miss any subsequent Flyer-ranger game that season? 2) The 'rivalries' of today pale to those of the past. Even watching the devils/rangers, Rangers-Islanders, rangers-Flyers etc are NO where near as intense as they were 20 years ago! The benefit today is that we have a quicker game - more technique - but these were the days. 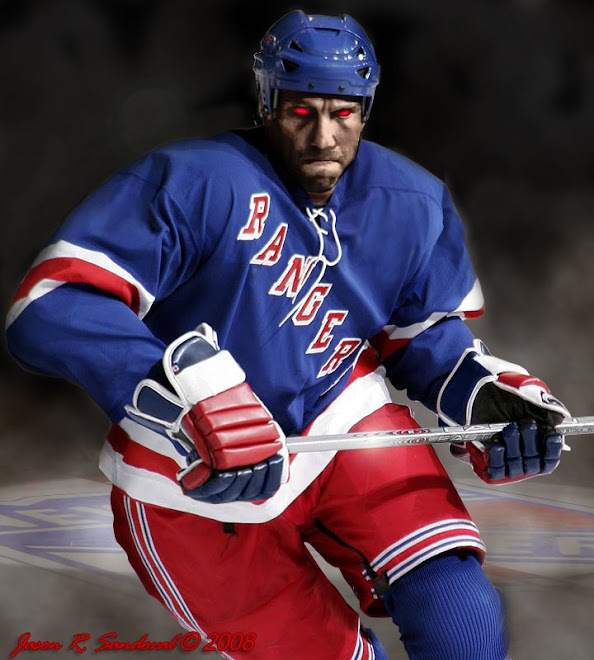 This is hockey as The Dark Ranger knew it -- living in Philly, going to the Spectrum - driving into NYC - MSG. My earliest memories of hockey were red blood, pools of it, on the grey-'ish ice. Dark, dark days for a Ranger (fan).